Ken Block says a test with factory Ford driver Jari-Matti Latvala in Finland last Friday has helped him to overcome some of the challenges he will face when he makes his debut on the country's FIA World Rally Championship round this week. The Gymkhana star will contest the high-speed gravel round in his regular Monster World Rally Team Ford Fiesta RS WRC and has been in Finland since last week to prepare for his third world championship appearance of 2012. Block completed his own test on Saturday ahead of the reconnaissance for Neste Oil Rally Finland getting underway on Monday. The American said it had been an invaluable exercise. Block used part of his test to offer friend and professional snowboarder Iikka Backstrom a high-speed ride in his Fiesta. Like Block, Backstrom is a DC Shoes-backed athlete. In an interview afterwards Backstrom said it was “the most scariest experience of my life”. Chris Atkinson says his participation in the FIA Asia Pacific Rally Championship will make up for his lack of running in the global series when he contests Neste Oil Rally Finland this week. Atkinson has only tackled two FIA World Rally Championship rounds since the end of 2008 but has been a regular in the regional competition for the last two seasons and currently leads the standings by 45 points following the recent Malaysian Rally. The 32-year-old Australian returns to rallying’s top tier in Finland in a Qatar World Rally Team Citroen DS3 WRC in place of Nasser Al-Attiyah, who is representing his country in the skate shooting section of the London Olympics. Al-Attiyah, meanwhile, will begin his bid for Olympic gold tomorrow (Monday) when he takes part in the qualifying round. The final is scheduled to take place the following afternoon. Finland's Marcus Gronholm won the Rally of Turkey to close the gap on championship leader Sebatien Loeb. He now trails the Frenchman, currently out of action with a broken arm, by 25 points with three races left. Ford team-mate and compatriot Mikko Hirvonen took second with Norway's Henning Solberg in third in a Peugeot. Britain's Colin McRae, hired by Loeb's Kronos Citroen team to try and peg back Gronholm, retired on the final stage in his first WRC event of 2006. Between them, Gronholm and Loeb have won every rally this season with the Frenchman, who could also miss the next rally in Australia, taking eight so far. "It will be difficult, but it's possible," said the Finn of his championship chances. Gronholm's latest win also moved Ford ahead Citroen in the constructors' championship, and they now lead by eight points. The remaining events are Australia (27-29 October), followed by the Rally of New Zealand (17-19 November) and the Wales Rally GB (1-3 December). 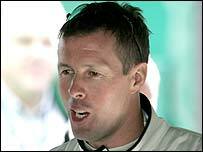 Colin McRae will make a world rally comeback in Turkey as replacement for injured champion Sebastien Loeb. Kronos Citroen driver Loeb, on the verge of a third straight WRC title, broke his arm in a cycling accident and misses the 13-15 October event. According to French newspaper L'Equipe, Loeb says he is unsure when he will be able to return to action. McRae, the 1995 world champion, was Loeb's team-mate at Citroen in 2003 but lost his drive at the end of that year. 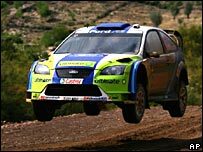 The 38-year-old Scot's last WRC appearance came at the end of 2005 with Skoda, when he competed in two events. McRae will be partnered by long-time co-driver Nicky Grist of Wales. The pair parted company in 2002 after several successful seasons together, with McRae saying their relationship had become "strained". A statement from Kronos said: "(Team boss) Marc van Dalen and (Citroen Sport director) Guy Frequelin have searched for the best solution to help the team defend its lead in both the drivers' and manufacturers' championships. 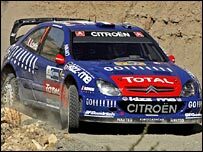 "Colin McRae has been chosen to help the team, and he is highly motivated to do his maximum to serve Sebastien and Kronos Citroen's interests." Frenchman Loeb, who has a 35-point advantage over Finland's Marcus Gronholm with four races left this season, has backed McRae's appointment. "Of all the drivers who were available, Colin is the one who has the best record, the greatest experience and who's also probably the fastest," said Loeb said. "Another important trump card is that he knows the car well." Loeb damaged his arm after falling off his mountain bike during training but still hopes to claim the championship title. "As long as I won't be there, it will be easier for Marcus to win rallies," said Loeb. "That said, if he has the slightest problem, he could be out of it without me having to get involved. "How soon I will return will depend on how it all develops and for the moment, it's impossible to say. "When you drive in rallies all year, you don't imagine that you can put your career at risk by riding a bike, but that's part of my physical preparation." Sebastien Loeb's hopes of clinching a third successive World Rally crown in Turkey next month have been dashed after he suffered a broken right arm. The Frenchman, 32, was hurt while mountain bike training in Switzerland and will miss the Rally of Turkey. Kronos Citroen driver Loeb leads the standings after 12 of 16 events by 35 points from Finland's Marcus Gronholm. He only needed to finish in front of Gronholm, or in the top four if his rival wins, to seal another title. "It is a really tough blow," Loeb said on his website. "I was going down a dirt track in a forest and my front wheel got stuck. "I went over the handlebars and landed on my shoulder." Kronos team boss Marc van Dalen refused to put a time frame on Loeb's recovery. "He underwent surgery on Wednesday and will not be available to compete in Turkey. We can't really look beyond that at the moment," he said. "We feel bad for him because he's an exceptional individual. But he's an athlete and athletes recover faster than us." After the Rally of Turkey (13-15 October), the next WRC round takes place in Australia from 27-29 October. Sebastien Loeb clinched his third successive Rally of Cyprus victory on Sunday to stretch his lead in the World Rally championship to 35 points. The Citroen driver's eighth win of the season was secured when he came home 21 seconds clear of Marcus Gronholm. Loeb now only needs to finish in front of Gronholm next time out in Turkey, or in the first four if the Finn wins, to clinch his third straight world title. Gronholm finished in third place, 26 seconds behind Loeb. Going into the third day, Loeb had a 21.8 second lead over Gronholm, which he extended when he won Sunday's opening stage. But the Ford driver proved he was not going down without a fight, winning the rest of the day's stages. "It's my third win in a row in Cyprus," said Loeb after his eighth win of the season. "It doesn't get much better." "I gave everything I could from start to finish. "Marcus pushed me very hard for two days. Now we can hopefully go to Turkey and confirm the championship." A disappointed Gronholm shrugged off his own setback, saying: "We are fighting to win rallies and manufacturers' (points). We are a bit down now, but wait, wait," he said. "It was a big ask to try and catch Seb. The team decided that it was more important that we confirmed second place and collected championship points. After the first stage this morning it was time to be sensible." Gronholm's team mate Mikko Hirvonen was third overall and said he would pay particular attention to the set-up of his Ford Focus in Turkey next month. "I made a big mistake with the car set-up," Hirvonen said. 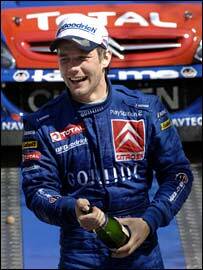 Sebastien Loeb, driving a Kronos Citroen, claimed his second successive victory in the Rally of Corsica. The French world champion led the event from start to finish and crossed the line 29 seconds ahead of Ford driver Marcus Gronholm of Finland in second. Rising Spanish star Dani Sordo put in another solid performance in his first WRC season for third place. Loeb's triumph extends his lead in this year's World Rally Championship to 11 points after wins in Spain and Mexico. Finland's Mikko Hirvonen, in his Ford, finished fourth 10.5 seconds behind Sordo while Frenchman Alex Bengue, driving a BSA-Peugeot, took fifth place. Petter Solberg's hopes of cutting Loeb's lead in the championship standings ended on Friday when the Norwegian's Subaru went off the track during the first stage. Loeb said: "I did not win all the stages like last year and it was not easy. I really had to fight to beat Marcus." "I'm happy to have taken so many points in these Tarmac rallies which are most suited to the Xsara. Remember Marcus is very strong on dirt. "I got into a good rhythm, my car handled the tight turns really well and the gap began to open up naturally. "He (Gronholm) was less comfortable from then on and he must have said to himself it was better to take eight points than lose 10. You can understand that." Gronholm was disappointed not to win but happy enough with another good showing on a surface not as suitable to his car as dirt. "I couldn't do much more," said Gronholm. "I knew on Friday when Sebastien had already gone 19 seconds clear that I'd find it hard to pull him back." World champion Sebastien Loeb of France claimed his first victory of the season with a win in the Rally of Mexico. The Citroen Xsara driver took the lead on the second day from Norway's Petter Solberg and won Sunday's three stages to claim success. Solberg finished second, 48.9 seconds behind Loeb, with Austrian Manfred Stohl third, nearly five minutes back. The win sent Loeb to the top of the standings after three rounds with 26 points, five ahead of Marcus Gronholm. The Finn, who had won the first two rallies of the season, crashed out on day one but was allowed to rejoin the race with a 20-minute penalty, five for each stage he missed, and he fought back to claim a point for eighth. Loeb's new team Kronos also took over at the top of the constructors championship with 34 points, three ahead of Gronholm's Ford. 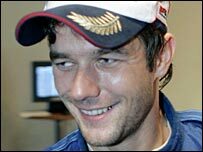 "This is a great win because it's the first for the Kronos team," said Loeb, who was WRC champion in 2004 and 2005. "I'm really happy. For Kronos, it's a big moment. This is a difficult rally and I lost a lot of time on the first day. "It was also important to put an end to Gronholm's run of victories." Daniel Sordo, a protege of former world champion Carlos Sainz, scored an impressive fourth place in his Citroen, while Henning Solberg was fifth in a Peugeot. Irishman Gareth MacHale put in his best performance in a world championship rally to claim points for sixth place in his Ford, one ahead of Subaru's Chris Atkinson. World title rivals Fernando Alonso and Michael Schumacher were evenly matched in practice for the Chinese Grand Prix. 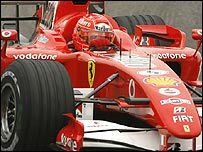 Schumacher was the second fastest race driver behind Ferrari team-mate Felipe Massa in Friday practice; Renault's Alonso was just 0.098 seconds behind. 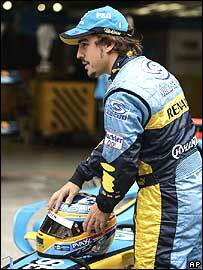 World champion Alonso, who has not won since June, is two points clear of Schumacher with three races left. Three test drivers led the times on Friday's second session, with Williams' Alexander Wurz fastest of all. Schumacher has not scored a point in his two previous appearances in Shanghai. And Ferrari's hopes were dealt a blow when Massa needed an engine change, for which the penalty is a demotion of 10 places on the grid. Alonso, winner in China last year, has a new and more powerful engine after a failure while he was heading for third place in the Italian Grand Prix at Monza three weeks ago. "I am very confident, as always," the Spaniard said. "I think that for the last three races we should be very competitive. "The car is really at maximum performance now, with no problems. We should be very quick. 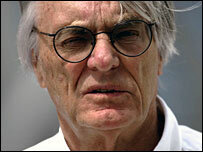 Now it is up to us and Ferrari to decide who is quickest." Alonso sat out the first session and set his fastest time early in the second. He went out again towards the end but was not close to the pace of the Ferraris and spun his car just before the end of the session as light rain started to fall. "We had to adjust our programme a little bit because of the rain in the afternoon session," the Spaniard said, "but we have a good baseline to work from with the car. "It felt comfortable to drive straight away, so while we need to fine-tune things overnight, I am quite happy at the moment. "This is a track I always enjoy, especially with the good memories from the championship win last year, and even with the V8 engines and the other changes since 2005, it still felt very good to drive today. "I think we need to be a bit cautious analysing the times, because the conditions on Friday are quite different to what we expect for the race." Singapore has started making plans to host a Grand Prix after new rules allowed the Formula One calendar to expand to a possible 20 races in 2008. The south-east Asian island is already examining four proposals to stage races which would be held on a street course. "The four bids are very, very good," Singapore Trade and Industry minister Lim Hng Kiang told the Today newspaper. Spanish city Valencia, Greece, Russia and South Africa have also declared their interest in hosting a race. 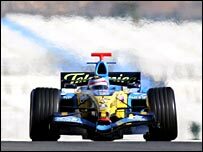 Mexico had also made plans to return to the F1 calendar while an Indian Grand Prix and a second race in the United States had been suggested. The FIA introduced new regulations in Paris last month which gave the green light to a maximum of 20 races per season from 2008. This season there are 18 races on the calendar after the Belgian Grand Prix was withdrawn to give organisers more time to make improvements to the Spa circuit. Organisers of the stand-alone GP2 races at Valencia's Circuit de la Comunitat are hoping they will help pave the way for Formula One races at the track. The F1 feeder series event was seen by 52,000 spectators at a venue which is soon to undergo major renovation. Regional sports secretary David Serra said: "It was a risk but it was worth the trouble. This type of event is absolutely profitable for Valencia. "GP2's drivers are knocking on Formula One's door and we are also." Valencia is already a favourite testing venue for Formula One teams. The Spanish Grand Prix is currently staged at the Circuit de Catalunya near Barcelona. Interest in the sport has surged in Spain thanks to the success of current F1 world champion Fernando Alonso. BMW have warned against unrealistic expectations as they prepare for their Formula One debut in Bahrain next week. BMW bought out the under-performing Sauber team last year and pin their hopes on drivers Nick Heidfeld and 1997 world champion Jacques Villeneuve. But team boss Mario Theissen insisted: "We are not expecting miracles. "What our achievements will look like we just don't know. We are aiming to make the most of our possibilities and advance step-by-step." 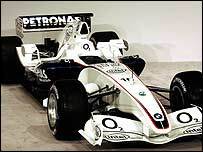 Theissen did admit that the F1.06 car was expected to be significantly better than last year's Sauber. "We can say that things are looking good at this stage of development," he said. "After an intensive winter testing programme, our drivers have given the car the thumbs-up. "The engineers are also convinced that a major leap has been made compared to the previous year." The season-opener in Bahrain on 12 March will be German Heidfeld's first race since the Turkish Grand Prix last August. He missed the last five races of 2005 due to a testing accident and a subsequent injury while out cycling. Heidfeld also warned that BMW will probably be outside of the championship-chasing pack. "My guess is that Renault and Honda will be in the lead to start with, possibly followed by McLaren and Ferrari and then a group of closely bunched teams," he said. "We will probably be in with that group." But he added: "I still feel pretty confident. I am desperately looking forward to my first race after a long gap and I can't wait to see what the competition is like."